Ball tab shows the list of ball items in the active model and provides various functions to manage those items. X,Y,Z : Ball center position in model local coordinate space. R: Radius of the ball. Append: Open the window to put a new ball item. Modify: Open the window to modify properties of selected ball items. Duplicate: Make copies of selected ball items by applying additional translation. Remove: Remove selected ball items. Matrix: Open the window to set matrix that is applied to ball positions. See the section below for details. "Matrix" defines additional transformation that is applied to ball positions prior to rendering. 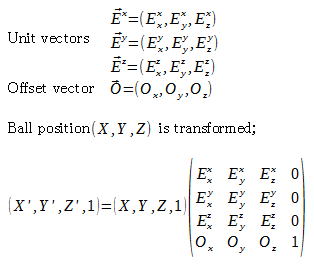 Unit vector X/Y/Z: You can define custom coordinate space to handle non-cubic crystallographic structures such as hexagonal or orthorhombic structures. *Note: Matrix is applied to only ball position. Ball radius is not changed.